An exceptional severe weather event produced 4 tornadoes, tennis ball size hail, and a swath of damaging wind for nearly 40 miles throughout Fairfield and New Haven Counties. The amount of damage over such a widespread area makes this one of the biggest severe weather events since the July 1989 tornado outbreak. 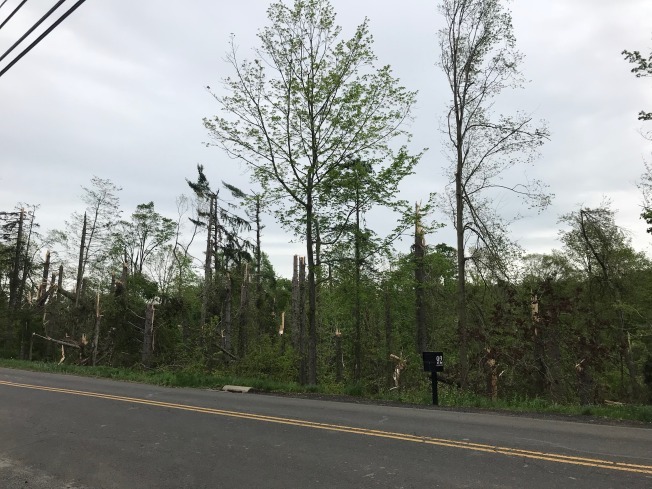 A substantial area of wind damage occurred from the New York border to Southbury near the Housatonic River. New Fairfield and Brookfield were particularly hard hit along with portions of Newtown, Danbury, Sherman, New Milford, and Bridgewater. Radar at 4:42 p.m. shows exceptionally powerful winds of 115 mph over New Fairfield. Base Velocity is shown here in the upper right panel with the bright blues and purple showing the strongest winds. The signal on radar was frightening and clear as day. An embedded supercell on a line of thunderstorms was producing exceptional wind. On the Long Island radar winds of nearly 115 mph were measured less than 3700 feet above the ground blowing toward the radar site. This is by far the most impressive wind signature I've seen in Connecticut. Nothing has come close. The winds were estimated by the National Weather Service to be between 100 and 110 m.p.h. in this area. That matched up very closely to what we were seeing on radar. As the storm moved toward the Housatonic River we saw more evidence of rotation and a tornado developed in Southbury.